My favorite poster was Haiti Poster project that was created by Miki Iwasaki. He has his own business, mi workshop in California. This poster really caught my eye because I could see strong his message from the simple design. It is constructed of silkscreen, wood, and steel hardware. The silkscreen is torn in two, and wood pieces bonded together like Band-Aids. 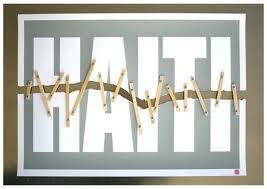 I think that he put his hope of Haiti’s rapid recovery in the poster.